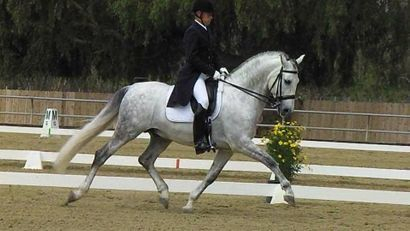 rider through classical principles in order to ride in lightness, specializing in in-hand work and piaffe and passage. He believes that the horse should enjoy the relationship as much as the riders do and strives to teach riders how to reach that harmony. Hired as head Rider of the touring Production of the World famous Lipizzaner Stallion Show. Hired at Temple Farms, a historic Lipizzan breeding farm that puts on a yearly summer performance at their lovely facility. It was at Temple Farms where he was given the opportunity to work closely with incredible European masters of Dressage such as Conrad Schumacher and Hans Reigler, former Chief Rider of the Spanish Riding School of Vienna Austria. It is this period that Victor was really able to hone his skills by blending both Classical and Competitive Dressage. Victor has spent time studying with Juan Jose Verdugo and Rafael Soto of the Royal School of Equestrian Art as well as working for Leslie Morse and Hilda Gurney. $75 due at registration to hold your spot. Please fill out the form below when registering.